The transformation is nearly complete. 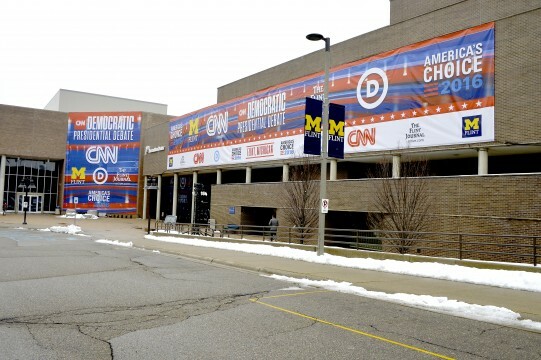 The University of Michigan-Flint buzzed with energy Saturday as campus continued to prepare for a major role in the Democratic Presidential Debate in Flint Sunday, March 6. The University, with CNN and others, converted the campus Recreation Center into a “Spin Room”, where about 500 journalists from across the globe will file their stories and interview campaign officials Sunday. The debate between presidential candidates Hillary Clinton and Bernie Sanders will be at The Whiting Auditorium but the eyes of the world are already on UM-Flint, with CNN broadcasting from the Frances Willson Thompson Library since Friday. CNN staffers, Democratic National Convention crews, along with other contract workers, added to the scene Saturday on campus. The CNN setup includes a full stage in the library atrium, along with support crews working behind massive drapes. The library was closed Saturday because of spring break, but will reopen Sunday. 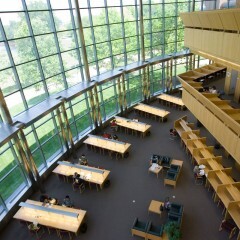 Several extra rooms will be opened Sunday for students to use for quiet study, said library director Robert Houbeck. “I’m really happy for the library to be able to contribute to this event. It’s important for the campus. 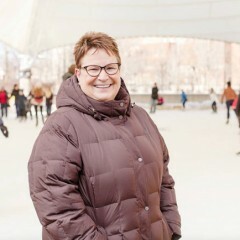 It’s important for our students and our community to see the university is part of the civic conversation, the democratic conversation of the country, being able to contribute to that,” he said, adding that it also showcases the library and university overall as two of the city’s many assets. The Recreation Center was transformed with large-scale draping, carpeting, more than 500 chairs, 125 tables, and about a dozen high-definition flat screen TV monitors. A massive university banner has been hung between two American flags in the center of the room above the media tables. The spin room and the Recreation Center will be open only to credentialed media. Crews spent much of the day Saturday conducting multiples tests of electronics and other equipment said Gary Parr, the associate director of Recreational Services at UM-Flint. About 60 students are working on campus with CNN and other groups coordinating the series of debate-related events on campus. Students are working with CNN’s marketing and PR departments to set up the press area and help with signage. 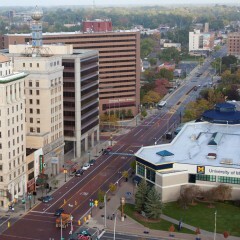 They will also be acting as runners and media guides on the university campus and around the city of Flint. The day of the debate, they will be acting as guides for guests, helping to run the televised production, and greeting and seating audience members. The University further shone the spotlight on Flint by working with several local restaurants to serve food to the media and dignitaries within the Recreation Center Sunday. Stefanie Norman, owner of Hot Cups at Flint Farmers’ Market, will sell coffee and donuts Sunday at the center. “It is nice to showcase the positives of the city and all these small businesses that are important are going to be there,” Norman said. The campus also will host a UM-Flint Debate Watch Party in the Northbank Center Ballroom Sunday. Doors open at 7 p.m. The event is free and open to the public. George Hakim, Director of Facilities and Operations at UM-Flint, said the university united in preparation for all the events. “This may be a once in a lifetime opportunity for a lot of people who work here and a lot of students who have the honor of being involved in this major event,” said Hakim.